St. Martin's Press, 9781250095473, 400pp. The riveting novel of iron-willed Alva Vanderbilt and her illustrious family as they rule Gilded-Age New York, from the New York Times bestselling author of Z: A Novel of Zelda Fitzgerald. Alva Smith, her southern family destitute after the Civil War, married into one of America’s great Gilded Age dynasties: the newly wealthy but socially shunned Vanderbilts. Ignored by New York’s old-money circles and determined to win respect, she designed and built nine mansions, hosted grand balls, and arranged for her daughter to marry a duke. But Alva also defied convention for women of her time, asserting power within her marriage and becoming a leader in the women's suffrage movement. With a nod to Jane Austen and Edith Wharton, in A Well-Behaved Woman Therese Anne Fowler paints a glittering world of enormous wealth contrasted against desperate poverty, of social ambition and social scorn, of friendship and betrayal, and an unforgettable story of a remarkable woman. Meet Alva Smith Vanderbilt Belmont, living proof that history is made by those who know the rules—and how to break them. THERESE ANNE FOWLER is the author of the New York Times bestselling novel Z: A Novel of Zelda Fitzgerald. Raised in the Midwest, she migrated to North Carolina in 1995. She holds a B.A. in sociology/cultural anthropology and an MFA in creative writing from North Carolina State University. "In another writer’s hands, Alva Vanderbilt’s immense wealth and carefully calculated life might have proved barriers to readerly sympathy. But Fowler’s portrait is so nuanced, so complicated by context, and so informed by her own capacious generosity that we can’t help being drawn in. 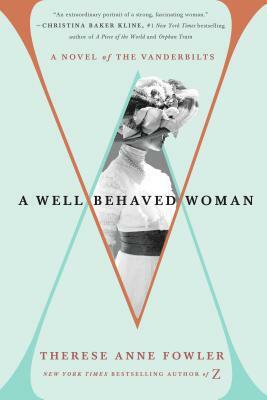 A Well-Behaved Woman is a deeply and sympathetically imagined guess as to who Alva might have been. This is a wonderful book!"